Developer and publisher Blizzard Entertainment helped shape the gaming community in the 90’s and early 2000’s with a series of genre-defining franchises. The RTS and Dungeon-Crawler genres, and LAN (local area network) multiplayer grew in worldwide popularity after the releases of StarCraft, WarCraft and Diablo; the MMO spin-off of Blizzard’s fantasy RTS series, World of WarCraft is one of the most successful MMO titles ever released, spawning a multitude of expansions, its own spin-off card game Hearthstone: Heroes of Warcraft, and the recent movie of the same name- “Warcraft”. The studio previously experimented with other genres with the SNES Fighter Justice League Task Force, and the iconic Platformer and Racing games The Lost Vikings and Rock n’Roll Racing (under “Silicon & Synapse”), however Overwatch is Blizzard’s first FPS in the studio’s 25 year legacy. Disregarding Heroes of the Storm, as it utilizes characters from other Blizzard properties, Overwatch is the first completely new IP to come from Blizzard in roughly 18 years, following 1998’s StarCraft. Akin to Valve’s Team Fortress 2 and the history of Mann Co, the complex lore of Overwatch is left to subtle in-game assets, comics and animated shorts left to Blizzard’s media channels- specifically YouTube and the game’s official website. In the not-so-distant future, scientists and the Omnica Corporation establish “Omniums” around the world- factories that produce “Omnics”, or sentient robots equipped with free-will AI. After a brief period of harmony between Omnics and humans, some Omnium facilities fell to a malicious “God Program” AI, and began producing militarized Omnics with the intent of killing humans; this event sparked the world war between robots and humans known as the “Omnic Crisis”. The United Nations created “Overwatch”, a team of the world’s most gifted doctors, scientists and soldiers to repel the rogue Omnic threat. With the fall of the Omnic rebellion and the God Program quarantined, Overwatch was restructured into a global peacekeeping unit. The two leading members of Overwatch- both from the US Soldier Enhancement Program- Jack Morrison and Gabriel Keyes became the new leaders of Overwatch and internal covert-ops team “Blackwatch”. Jealous of Morrison’s new position as Strike Commander and his overwhelming popularity with public audiences, Reyes organized a rebellion which led to a destructive battle between Overwatch and Blackwatch at their Swiss HQ. Both Morrison and Reyes were presumably killed in the struggle, though both return later as “Soldier: 76” and the fabled terrorist “Reaper”. Having seen the destruction caused by Overwatch in Switzerland, the UN passed the “Petras Act”, prohibiting the organization from conducting any missions solo or as a unit. With the Petras Act essentially disbanding Overwatch, terrorist organizations began to rise across the globe. Without the looming danger of Overwatch, the terrorist unit “Talon” sent its ace sniper Widowmaker to assassinate the Omnic religious leader Tekhartha Mondatta after his speech on Omnic and human peace. This event sparks the “Second Omnic Crisis” and yet another Omnic uprising within Russia, resulting in the loss of over 15,000 lives. Despite being a direct violation of the Petras Act, original Overwatch member Winston recalls the surviving Overwatch members and other peacekeepers from across the world back into action to defend the world from terrorist organizations and the fallout of the Second Omnic Crisis. “Volskaya Industries” is a major Russian manufacturer of human-piloted “Svyatogor” mechs- the giant robots seen in the background of the map, which are responsible for protecting Siberia against the rogue Omnic forces; under the protection of Helix Security Systems, the “Temple of Anubis” is an AI research center under the Giza Plateau, and the current holder of the “Anubis” God Program responsible for the first Omnic Crisis; “Watchpoint: Gibraltar” is a former outpost located at the Rock of Gibraltar, where Winston reinstates the surviving Overwatch team; the site of one of the largest integrated Omnic populations, “King’s Row” is home to political and social unrest, and serves as the backdrop for Tekhartha Mondatta’s final speech before his assassination from Widowmaker. Maps are chosen randomly for those participating in Quick Play, however players also have the option of selecting individual maps and other modifiers through the Custom Game and Versus AI options under the Play menu. For those looking for a fun alternative to the core game, the Weekly Brawl option is a weekly Hero-specific game mode featuring adjusted character stats and bonuses. While it may lack the gameplay modes found in other competitive shooters, it’s unfair to compare Overwatch with one of its most obvious class-based competitors- Team Fortress 2– in terms of content, as the latter has 9 years of content updates. What players will find is an enjoyable, fast-paced shooter with one of the largest character rosters to-date, competing only with Gearbox Software’s Battleborn. Though matches are limited to just 12 players in 6-vs-6 matches, players can do battle with a staggering 21 character classes- or “Heroes”. Each Hero is categorized into a unit type such as “Support”, “Defense” or “Offense”, with his or her own unique abilities; Reinhardt is a slow-moving brute who protects teammates using his large shield, while characters like McCree and Soldier: 76 are expert marksmen strictly primed for being on the attack. During the fight, each Hero has the chance to unleash his or her “Ultimate” ability; indicated by the circular gauge at the bottom of the screen, the Ultimate gauge increases with every landed shot or attack. Depending on the character, this ability has the potential to be a game-changing attack or status effect. 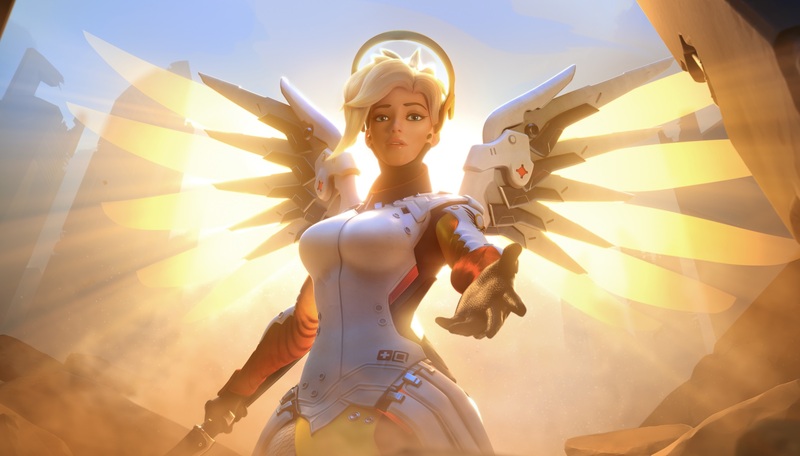 Characters like Zarya, Reinhardt and Mei have Ultimate abilities that prevent affected opponents from moving, while Hanzo and Genji both have Ultimates that can potentially kill opponents in one hit; arguably the most powerful Ultimate ability in the game, Mercy has the power to resurrect fallen teammates. The Hero Change screen is tailored for new players, as it shows additional info that may only come with invested experience in other games. 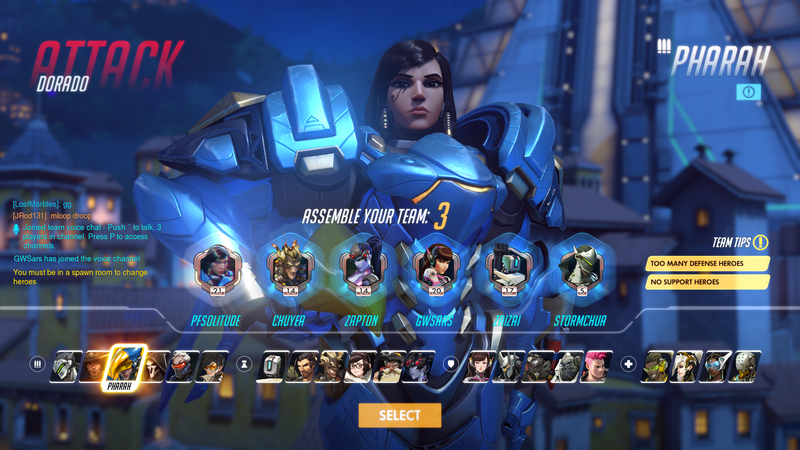 Heroes are clearly grouped and marked with their intended usage, ranging from the Offensive characters on the left, to the Support, Tank and Healer Heroes on the right. 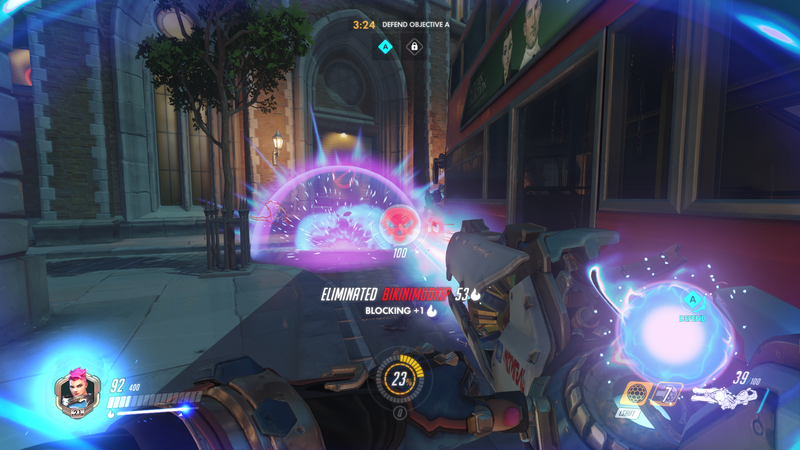 As players select their Heroes during the countdown phase at the start of the match, the UI displays the active weaknesses of the current team; if no one picks Symmetra or Torbjorn, a message will state that the team has “No Builders” to create turrets or teleporters, or “No Healers” if no one selects Mercy, Lucio or Zenyatta. After each match, players are treated to a short “Play of the Game” highlight, theoretically featuring the most influential moment of the match….Theoretically. 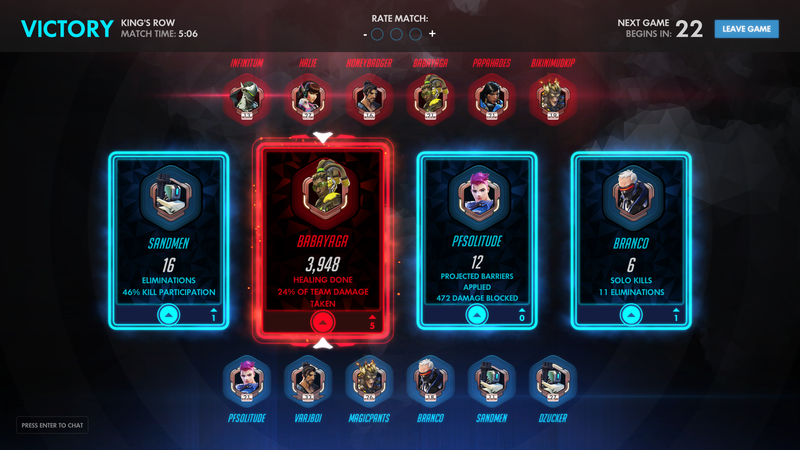 Four players are then highlighted on the Results screen for their match statistics; the 12 players can then vote for the highlighted player he or she believes performed the best during the match. Whoever gains more than 5 votes will receive an “Epic” shout-out from Overwatch‘s announcer, and an additional experience boost on the final Experience screen. Players will build experience points with each match, increasing their overall Level. 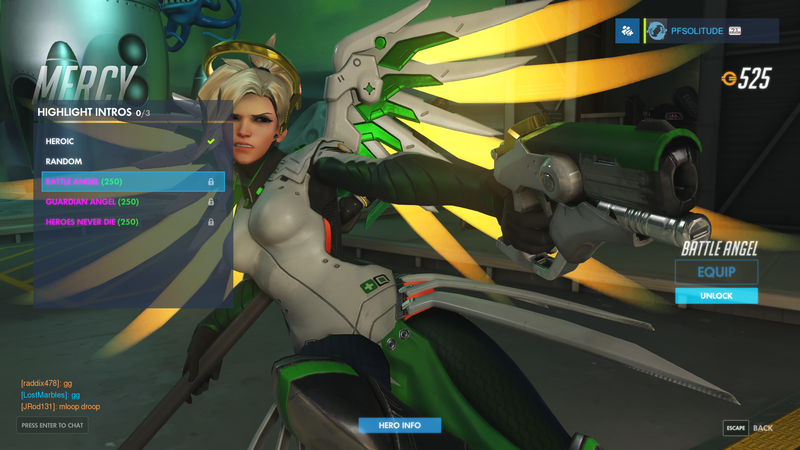 With each new level, players are awarded a “Loot Box” containing four randomly selected rewards; these items are often in-game currency, Hero skins, dialogue and sprays that the player can use to “tag” map environments (i.e. custom graffiti), “Highlight”/”Play of the Game” cinematics, or a new player-icon; duplicate items automatically exchanged for in-game currency. As there are a significant amount of unlockables to be found across the 21 Heroes, players can alternatively spend real money on Loot Boxes instead of waiting for a new Box at each level. Much like the rest of their franchises, Overwatch possesses its own unique style among the rest of Blizzard’s IPs. While it’s not quite to the degree of cel-shading, Overwatch has a slightly caricaturistic slant to it, with its Hero designs featuring both realistic body structure and cartoonish physiques found only in comics. A majority of the maps are inspired by actual locations, but with futuristic modifications that create sort of a “fantastical familiarity”. 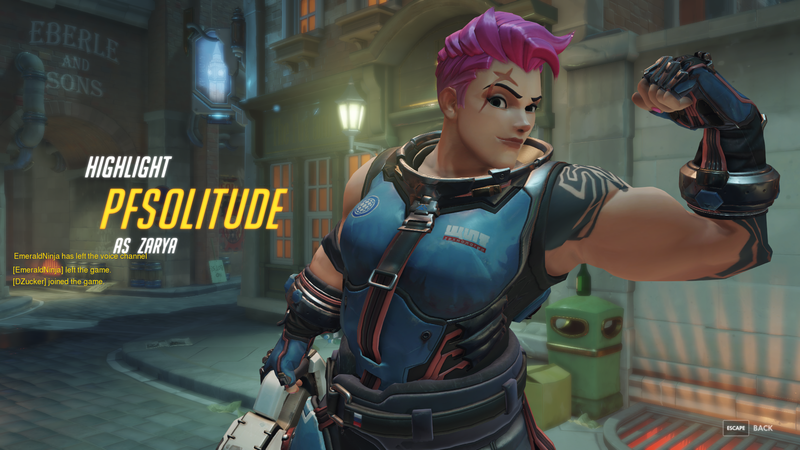 Though music is limited to the menus and brief moments of each match, Overwatch‘s soundtrack is reminiscent of a Hollywood epic; players are greeted with the triumphant Overwatch theme every time they open the game, and are treated to a series of pieces inspired by the real-world locations of each map. The last 30 seconds of each match are accentuated with an intense fanfare that’s sure to pressure players into giving it their all during the final moments. Overwatch may lack the robust gameplay modes found in other class-based shooters like Team Fortress 2 and The Mean Greens, but its shortcomings are quickly forgotten in the face of its massive 21-character roster. For their first entry into the world of competitive shooters, Blizzard’s Overwatch is sure to please class-based shooter players and Blizzard fans alike.